Blood glucose is a powerful indicator to know how your body creates ATP, the energy currency of the cell. If your body knows how to utilize body fat efficiently to generate ATP, you will be leaner and less concerned about fuel during prolonged exercise. Humans were evolved to hunt and gather without food for days. This means we are designed to burn fat while aerobically exercising without emptying our liver glycogen*, the biggest sugar storage in the body. However, the majority of modern humans have turned to be sugar-burning machines and constantly use blood sugar even when sitting, driving and watching TV which means they need to consume more sugar while running. Blood sugar levels are usually well maintained between 70-110mg/dl by two major hormones, insulin** and glucagon***. They act like the gas and brake pedals in a car. Insulin is up when blood sugar rises and glucagon is up when blood sugar goes down. On the other hand, moderate exercise reduces insulin secretion and enhances glucagon secretion to support working muscles. When exercise is sustained more than 20 minutes, a decrease in insulin secretion and increases in glucagon enhance hepatic sugar production. Glucagon dominant status lets the whole body provide supplies (fatty acids and amino acids) to the liver, creating more blood sugar and ensuring energy supply for working muscles. Each person has a different metabolic preference, depending on his or her lifestyle and dietary differences. Although we all can create blood sugar without food for days, people who are used to high levels of blood sugar forget how to use the metabolic pathway. To find their own metabolic capabilities, 20 participants (age 37-63) skipped breakfast and checked their fasted blood sugar 3 times, before, during and after while running or riding aerobically for 1hr. Here are the results. *Glycogen: Polysaccharide of glucose that serves as a form of energy storage primarily in the liver and muscle. However, only liver glycogen can be shipped out as blood sugar. ** Insulin’s role includes helping muscle, fat, and liver cells absorb glucose from the bloodstream, lowering blood glucose levels by stimulating the liver and muscle tissue to store excess glucose, lowering blood glucose levels by reducing glucose production in the liver and enhancing adipose cells to absorb glucose and inhibit lipolysis (breaking down fat into fatty acids and glycerol). *** Glucagon stimulates the liver to produce sugar from glycogen, lactate, protein (amino acids) and lipid (glycerol), oxidizes fat (triglyceride) to fatty acids and glycerol in adipose tissues and muscles and breakdowns proteins to amino acids in muscle tissues. The people categorized in this type maintained or raised their blood sugar levels after 1 hour of exercise although some people needed more time to enhance the hepatic sugar production. This data suggest that they can workout before breakfast and burn body fat efficiently. They are recreational but well-trained runners meaning their blood sugar rose at 30 minutes and sustained high levels at 1 hour. It should be noted that their exercise intensities were higher than others. The data suggest that they can run aerobically for a few hours only with water. 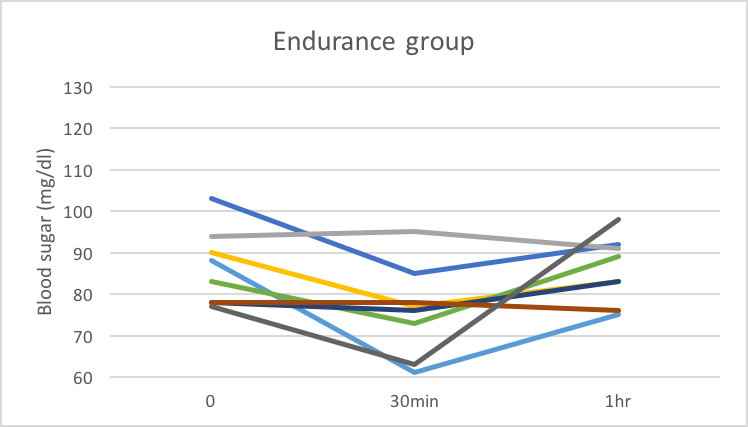 I expected the lowering of their blood sugar at the 30 minute mark since the levels of fasted blood sugar before exercising were relatively high. However, their blood sugar levels went up at 30 minute and went down at 1 hour, suggesting they did not store enough hepatic glycogen even though their fasted blood sugar levels were relatively high. This data implies that their insulin activity was low or their tissues were becoming insensitive to insulin stimultion. Their blood sugar levels went up after 30 minutes of walking and running, and went down after 1 hour. Their fasted blood sugar levels were below 83mg/dl before exercising, meaning they were not insulin insensitive but were running out of glycogen very quickly. Some of the many possible reasons are, low calorie intake, high basal metabolism, poor digestive system, hyperthyroidism and liver problems. In general, exercise below 50-65% of one’s maximum heart rate is in the fat burning (aerobic) zone. However, people categorized in this type did not utilize their body fat for hepatic sugar production so that the levels of blood sugar went lower by moderate exercise. This type is very common in recreational runners and riders, who are afraid to bonk and consume sugar and bars a lot. Remember, you can fuel working muscles by using your own glycogen, lactate, fatty acids and amino acids during aerobic exercise. You can recover the level of blood sugar even after a sprint by running or riding slowly.